By a ratio of more than two-to-one (59% versus 27%), Latinos disapprove of the way the Obama administration is handling deportations of unauthorized immigrants, according to a new national survey of Latino adults by the Pew Hispanic Center, a project of the Pew Research Center. 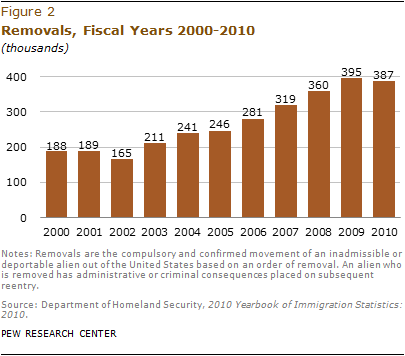 Deportations have reached record levels under President Obama, rising to an annual average of nearly 400,0001 since 2009, about 30% higher than the annual average during the second term of the Bush administration and about double the annual average during George W. Bush’s first term. Even as deportations have been rising, apprehensions of border crossers by the U.S. Border Patrol have declined by more than 70%—from 1.2 million in 2005 to 340,000 in 2011. This mirrors a sharp drop in the number of unauthorized immigrants entering the U.S. since the middle of the last decade (Passel and Cohn, 2010). More than eight-in-ten (81%) of the nation’s estimated 11.2 million unauthorized immigrants are of Hispanic origin, according to Pew Hispanic Center estimates (Passel and Cohn, 2011). Hispanics accounted for an even larger share of deportees in 2010—97%. (U.S. Department of Homeland Security, 2011a). 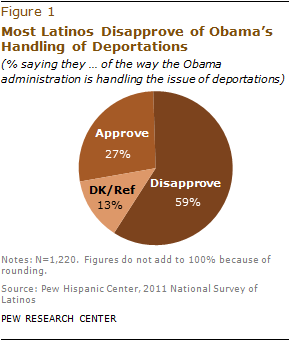 Not all Latinos are aware that the Obama administration has stepped up deportations of unauthorized immigrants. In response to a question on the Pew Hispanic survey, a plurality (41%) of Latinos say that the Obama administration is deporting more unauthorized immigrants than the Bush administration. Slightly more than a third (36%) say the two administrations have deported about the same number of immigrants. And one-in-ten (10%) Latinos say the Obama administration has deported fewer unauthorized immigrants than the Bush administration. Disapproval of Obama’s policy is most widespread among those who are aware that deportations have risen during his tenure. Among this group, more than three-quarters (77%) disapprove of the way his administration is handling the issue of deportations. Among those who are not aware that an increase has occurred, slightly more than half disapprove. Awareness of the level of deportations is higher among foreign-born Hispanics than among native-born Hispanics—55% versus 25%. It is even higher among those who are most at risk of deportation. Seven-in-ten (71%) Hispanic immigrants who are not U.S. citizens and do not have a green card—a group that closely aligns with the unauthorized immigrant population2—say the Obama administration has deported more unauthorized immigrants than the Bush administration. These findings are from a new national survey of 1,220 Hispanic adults ages 18 and older conducted by landline and cellular telephone, in English and Spanish, from November 9 through December 7, 2011. The margin of error for the full sample is plus or minus 3.6 percentage points at the 95% confidence level. For a full description of the survey methodology, see Appendix B. In recent years, the debate over illegal immigration has often been posed as a choice between two competing priorities—increasing border security and enforcement or providing a path to citizenship to immigrants who are in the country illegally. Latinos are nearly twice as likely as the general public (42% versus 24%) to say the priority should be a path to citizenship for immigrants who are in the U.S. illegally. About as many Latinos as the general public (46% versus 43%) say equal priority should be given to enforcement and legalization. 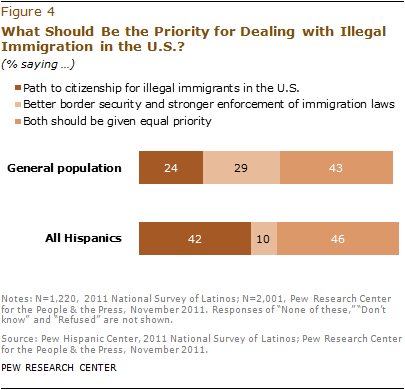 Just 10% of Latinos say priority should be given to better border security and enforcement, compared with 29% of the general public. The Pew Hispanic survey also reveals that, heading into the 2012 presidential campaign, Obama and the Democratic Party continue to enjoy strong support from Latino registered voters. In a hypothetical match-up against former Massachusetts Gov. 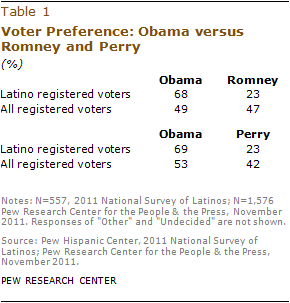 Mitt Romney, Obama wins 68% to 23% among Latino registered voters. And in a match-up against Texas Gov. Rick Perry, Obama wins the Latino vote 69% to 23%.3 These results closely match the outcome of the 2008 presidential election, when Obama carried the Latino vote over Republican John McCain by 67% to 31% (Lopez, 2008). Even among those who disapprove of the way Obama is handling the issue of deportations, a majority support his reelection over either of these two potential Republican challengers. Obama would carry this group by 57% to 34% against Romney and 61% to 31% against Perry. The survey also shows that identification with the Democratic Party among Hispanic registered voters remains strong. Two-thirds (67%) of Hispanic registered voters say they identify with or lean toward the Democratic Party, while 20% say the same about the Republican Party. And when asked which party has more concern for Hispanics, 45% say it’s the Democratic Party, while 12% say it’s the Republican Party. The share that identifies the Republican Party as the better party for Hispanics is up six percentage points since 2010. Despite Obama’s strong showing among Latinos when compared with potential 2012 Republican rivals, he has suffered a decline in his overall approval rating as president. Today 49% of Latinos approve of the job he is doing, down from 58% in 2010. Among the general public, Obama’s approval trend has been more stable during the past year (Pew Research Center for the People & the Press, 2011a). His current rating—46%—is still somewhat lower among the general public than among Latinos, but this gap has narrowed significantly in the past year. Among Latinos who disapprove of the Obama administration’s deportation policy, just 36% approve of the president’s overall job performance while 54% disapprove. The survey finds that jobs, education and health care are the top issues for Hispanic registered voters as they think about the upcoming presidential election. 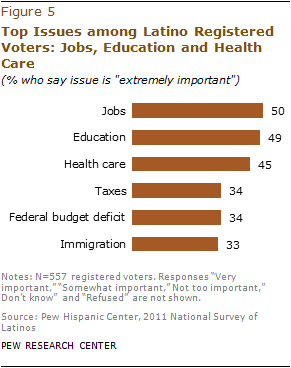 Half identify jobs as extremely important to them personally, followed closely by education (49%) and health care (45%). These top three reflect the same three issues Hispanic registered voters identified as most important in 2010 (Lopez, 2010) and in 2008 (Lopez and Minushkin, 2008). One-third (33%) of Latino registered voters say immigration is extremely important to them personally, statistically unchanged since 2010. About a third also describes taxes and the federal budget deficit as extremely important issues. More than half (56%) of all Latinos say they are dissatisfied with the direction of the country today, while 38% say they are satisfied. Among the general public, 78% are dissatisfied with the nation’s direction while 17% are satisfied (Pew Research Center, 2011). One-quarter (24%) of all Latinos say they know someone who has been deported or detained by the federal government in the past year. The share of convicted criminal deportations among all deportations reached a high of 44% in 2010, up from 29% in 2008. Nine-in-ten (91%) Latinos support the DREAM Act, legislation that would permit young adults who were brought to the U.S. illegally when they were children to become legal residents if they go to college or serve in the military for two years. More than eight-in-ten (84%) Latinos say unauthorized immigrants should be eligible for in-state tuition at public colleges if they went to a high school in their state and were accepted at a public college. More than half (56%) of Hispanic registered voters say they have given little or no thought to the candidates who may be running for president in 2012. When asked about their opinion of Florida Sen. Marco Rubio, more than half (54%) of Latino registered voters say they have never heard of him, can’t rate him or responded “don’t know.” Rubio, who is of Cuban ancestry, has been mentioned as a possible Republican vice presidential running mate. Among Latino registered voters, 35% describe their political views as conservative, 32% describe them as moderate and 28% describe their political views as liberal. The 2011 National Survey of Latinos (NSL) focuses on Latinos’ views on immigration policy and the upcoming presidential election. The survey was conducted from November 9 through December 7, 2011, in all 50 states and the District of Columbia among a randomly selected, nationally representative sample of 1,220 Latino adults, 557 of whom say they are registered to vote. The survey was conducted in both English and Spanish on cellular as well as landline telephones. The margin of error for the full sample is plus or minus 3.6 percentage points. The margin of error for the registered voter sample is plus or minus 5.2 percentage points. Interviews were conducted for the Pew Hispanic Center by Social Science Research Solutions (SSRS). This report was written by Associate Director Mark Hugo Lopez, Research Associate Ana Gonzalez-Barrera and Research Assistant Seth Motel. Paul Taylor and Rakesh Kochhar provided editorial guidance. The authors thank Paul Taylor, Cary Funk, Leah Christian, Richard Fry, Scott Keeter, Rakesh Kochhar, Rich Morin, Kim Parker, Eileen Patten and Gabriel Velasco for guidance on the development of the survey instrument. Rakesh Kochhar and Jeffrey Passel provided comments on earlier drafts of the report. Eileen Patten number checked the 2011 National Survey of Latinos topline. Gabriel Velasco number checked the report text. Marcia Kramer was the copy editor. The terms “Latino” and “Hispanic” are used interchangeably in this report. “Native born” refers to persons who are U.S. citizens at birth, including those born in the United States, Puerto Rico or other U.S. territories and those born abroad to parents at least one of whom was a U.S. citizen. “Foreign born” refers to persons born outside of the United States, Puerto Rico or other U.S. territories to parents neither of whom was a U.S. citizen. “Foreign-born U.S. citizens” refers to persons who indicate they are “foreign born” and who indicate they are U.S. citizens. The terms “foreign-born U.S. citizens” and “naturalized U.S. citizens” are used interchangeably in this report. “Foreign-born legal residents” refers to persons who indicate they are foreign born and who say they have a green card or have been approved for one. “Foreign born who are not legal residents and not U.S. citizens” refers to persons who indicate they are foreign born and who say they do not have a green card and have not been approved for one. Language dominance is a composite measure based on self-described assessments of speaking and reading abilities. “Spanish-dominant” persons are more proficient in Spanish than in English, i.e., they speak and read Spanish “very well” or “pretty well” but rate their English-speaking and reading ability lower. “Bilingual” refers to persons who are proficient in both English and Spanish. “English-dominant” persons are more proficient in English than in Spanish. The 2011 National Survey of Latinos was fielded from November 9 through December 7, 2011 and included a question about a hypothetical match-up between Obama and Republican Herman Cain. However, on December 2 Cain withdrew from the Republican nomination race. Results from survey data collected through December 1, 2011 show that in a hypothetical race between Obama and Cain, Obama would win 69% of the Latino vote compared with just 22% for Cain.